I love all of the different tones of the Feel knob, and it certainly is the most germanium sounding fuzz I have ever heard. That cleanup when you back down the volume knob is spot on germanium. No other silicon fuzz I’ve played does that just right. Tons of volume without getting that shrill papery sound. Cuts right through and sounds absolutely HUGE! It really worked great with both a strat and my 335. Really great to have the germanium feel with the strat but not have it get too muddy with the 335. Applications: The RF™ is BEST placed BEFORE buffered pedals. 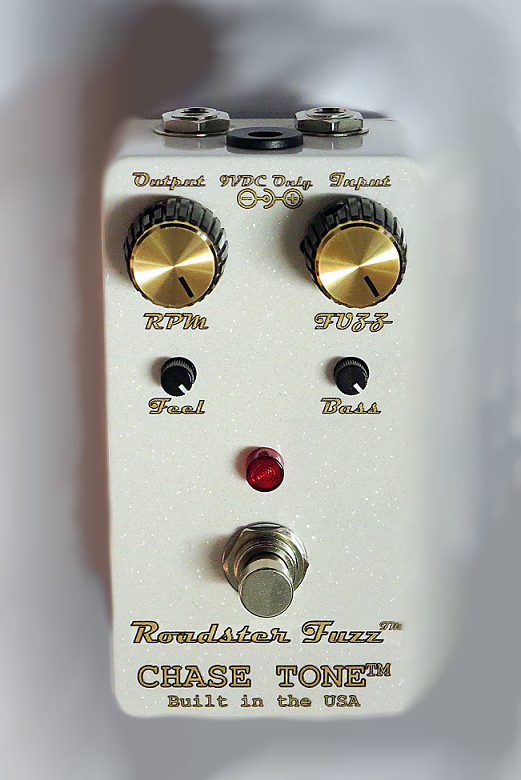 The Roadster Fuzz™ has a unique RPM KNOB allowing you to be in complete control of a unity or boosted signal to a tube amplifier. 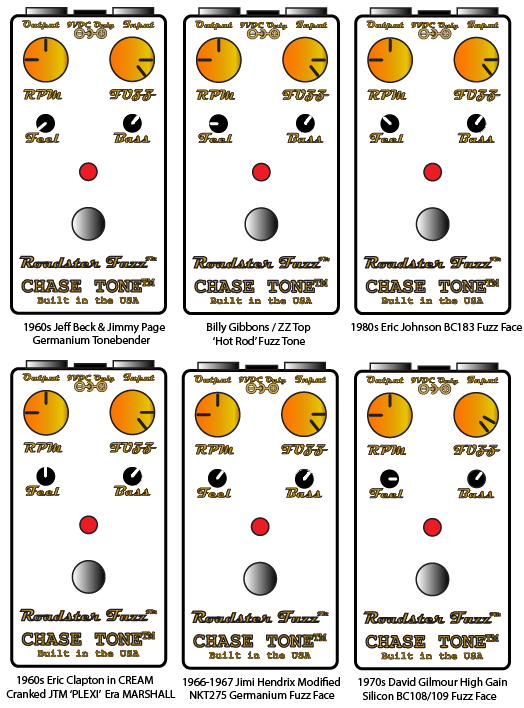 Higher than NOON RPM Knob settings act like a Treble Booster. 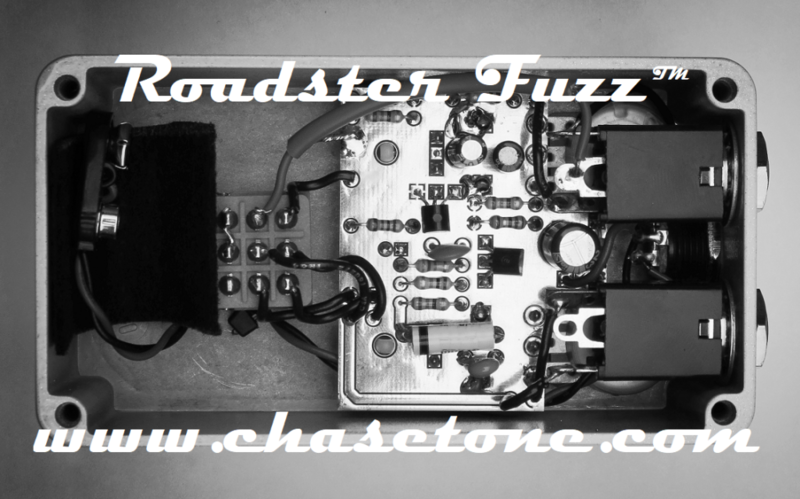 The Roadster Fuzz™ has enough gain to be used on a clean tube amp at low volume levels. Improved, LOW NOISE design allows for layering the fuzz on CRANKED distorting tube amplifiers. Players LOVE the Bass Knob as it doubles as a ‘use with a Wah and/or Humbuckers’ knob when turned Counter-Clockwise. Low Noise- Hear all the nuance and dynamics of your playing and guitar knob settings when recording. Single Coil & Humbucker Compatible- Makes single coils sound FAT and harmonic; Humbuckers SING with harmonic sustain. FUZZ – Adjusts Fuzz content. Improved design produces THICKER, FATTER and WARMER FUZZ tones at lower settings and reduces background noise. Improved design allows fast and easy adjustments without having to adjust any other knobs to compensate! Kyle this pedal is excellent thank you… probably the best thing you have made. Really has that violin like sound, and can be the opposite of that as well. I am really blown away. Wow. 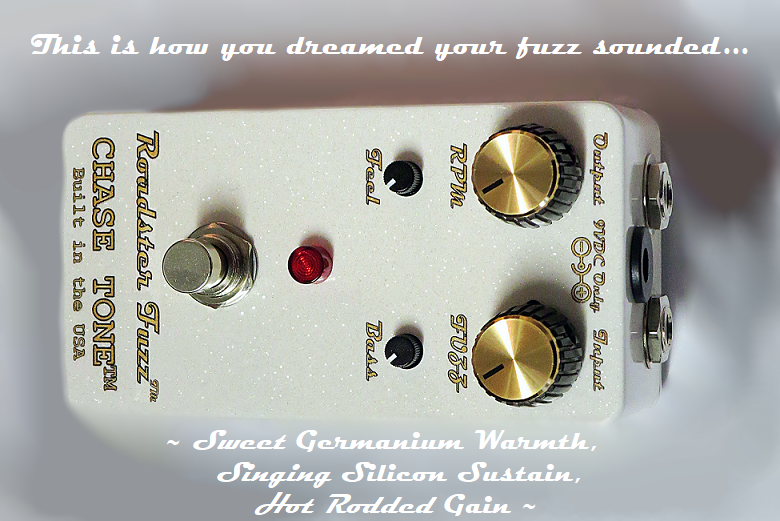 FEEL– Adjusts Feel and Character of the Fuzz Tone. Counter-clockwise simulates a dying battery, “Spirit in the Sky” style fuzz tone and fuzzy Germanium Tonebenders. Noon produces THICK, FAT and WARM Germanium Fuzz Face and cranked 1960s JTM45 & JTM45/100 era Marshall ‘Plexi’ amplifier tones. 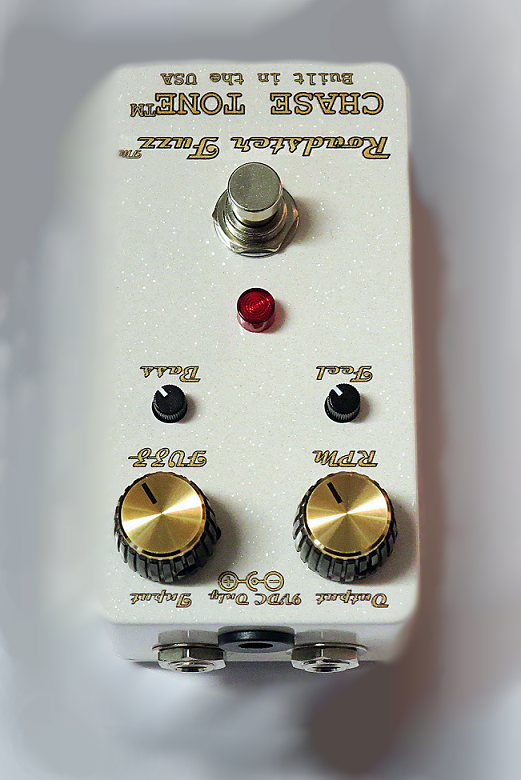 Clockwise produces glassy, singing Silicon Fuzz Face tones with superior guitar volume cleanup. CHASE TONE™ has figured out how to make silicon transistors SOUND & FEEL like IMPOSSIBLE-TO-FIND, cherry picked, vintage germanium transistors but with MORE GAIN, SUSTAIN, OUTPUT and LESS NOISE! Temperature Stable. Standard Polarity Power. Kyle, Played the Roadster Fuzz™ over the weekend. It sounds great. I first tuned it to sound like a germanium fuzz (bass knob all the way clockwise, and feel knob at 1:00). I was really surprised by how “germanium-like” the pedal sounded. Really fat, warm fuzz tones at this setting. If I didn’t know there were silicon transistors in there, I would have thought it was a germanium fuzz for sure (and a fantastic one at that). Of course, the bonus is that it really cleans up well, probably better than other germanium I’ve tried. Honestly, I was having so much fun with it at this setting that I didn’t try it at other settings. I’m sure I’ll get into that later this week. Great job with this pedal, Kyle! And thanks again. Much appreciated! Best regards, Dominic C.
UNIQUELY FINE-TUNE THE FEEL & RESPONSE WITH THE TURN OF ONE (Feel) KNOB! 1960s Germanium Tonebender; 1960s EJ BC183 Fuzz Face; Cranked JTM era Plexi; 1960s Germanium NKT275 Fuzz Face; 1970s BC108C/BC109C Silicon Fuzz Face; AND MORE! TONE TIP: Rotating the Feel Knob Clockwise Also Increases Output. BASS – Adjusts Bass and Input Gain. Full Clockwise removes circuit. Counter-Clockwise rotation cuts Bass and Input Gain for Humbuckers and doubles as a “use with a Wah without squealing” in a [Guitar > Wah > RF > Amp] signal chain. Vintage-Spec, New Production Polyester Film and Foil Capacitor. Rear Mount Jacks and smaller COOL Retro TALL MXR style box takes up half the space! New Cool 70s Retro ROADSTER™ Box is Pedal Board Friendly. HOT ROD ‘White Pearl Dust™ Powder Coat Finish (Zero Ozone Emissions and Ultra-Durable) with Lamborghini GOLD METALLIC PRINT. SOLD OUT! Contact us to get on the wait list for the next updated release! Limited Edition! GET ONE WHILE YOU CAN!